1 Year Full Access Dealer Subscription Included with This Hardware Kit!! The VCM II is the brand new diagnostics interface from Ford ® for use with the Integrated Diagnostics Software (IDS). 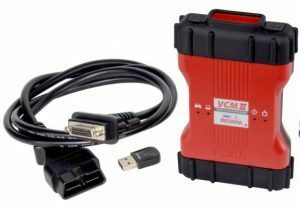 The VCM II and IDS, along with a dedicated laptop, provide full dealer diagnostic capabilities for most 16 pin Fords ®. A fantastic new function of the VCM 2 is its ability to communicate wirelessly with your laptop or computer without any hardware or software upgrades. This allows technicians to work on vehicles remotely while the VCM II is connected directly to the vehicle.